This page covers the author of Fingersmith. For other authors named Sarah Waters, see the disambiguation page. Join us for a reading group discussion The Paying Guests by Sarah Waters! Writers Anna Hope and Sarah Waters read from and discuss their latest works with Carol Off. Carol Off has been a host of CBC Radio’s As It Happens since 2006. Previously a documentary reporter for The National, she has extensive experience in both Canadian and international current affairs. Off is the author of several bestselling books of non-fiction, including The Ghosts of Medak Pocket: The Story of Canada’s Secret War, which won the prestigious Dafoe Foundation Award. She is also the recipient of numerous awards for her television and radio work, among them a Gemini and two gold medals from the New York Festival of Television. 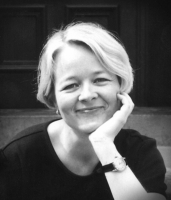 Sarah Waters is the bestselling author of five previous novels: Tipping the Velvet, Affinity, Fingersmith, The Night Watch and The Little Stranger. Winner of many literary awards, she has been shortlisted for both the Man Booker Prize and the Orange Prize. She lives in London. Waters presents The Paying Guests, a masterful novel of brilliant storytelling, sensuality and psychological suspense set in post-WWI England. Bestselling author Sarah Waters reads from and discusses her latest novel, The Paying Guests at the Capitol Theatre in Port Hope. NOW Magazine’s Susan G. Cole will interview and Ed Greenwood will host. For tickets and more information, please visit the Port Hope Public Library (905-885-4712) or Furby House Books. Moving back through the 1940s, through air raids, blacked-out streets, illicit partying, and sexual adventure, to end with its beginning in 1941, The night watch tells the story of four Londoners whose lives connect in tragedy, stunning surprise and exquisite turns, only to change irreversibly the the shadow of a grand historical event. Sarah Waters discusses The Little Stranger. Sarah Waters on tour for The Little Stranger. Sarah Waters reads from The Little Stranger. Sarah Waters's book The Paying Guests was available from LibraryThing Early Reviewers. "Sarah Waters" is composed of at least 3 distinct authors, divided by their works. You can edit the division. Sarah Waters is composed of 4 names. You can examine and separate out names.